Chronicle is a sometimes fun, slightly dark film about a boy and his camera. Directed by Josh Trank (his first feature film, although he’s worked on the TV series The Kill Point, Dante’s World and Big Fan), this “found-footage” drama opens with a shot of a menacing white door. The view of the lens is necessarily shaky and the cameraman (or boy) invisible. The impermanence of the lens is compounded by the violent, vibration of the door. As another invisible being pounds against it and furiously shouts for it to be opened, we finally see the reflection of the boy with the movie camera. Brace yourself; things are about to get a wee bit angsty. “I’m filming things now,” explains main character Andrew Detmer (played by Dane DeHaan, critically acclaimed young actor from HBO’s In Treatment) to his cousin Matt (played by newcomer, Alex Russell). The cousin is introduced as a sort of faux-friend to Andrew, or a friend by familial default. He’s also the kind of kid who starts conversations with questions like, “Have you ever read any Arthur Schopenhauer?” The two make for an interesting pair, but unlike Andrew, Matt has an actual social life, despite his penchant for philosophical quandaries. At the film’s start, Andrew is a walking punching bag, and the script pointedly depicts the abusive, alcoholic father as the real, monstrous villain. The found-footage style is actually quite useful during the father/son interactions. The moments of abuse are delivered in a severely straightforward and unsentimental way. Much of the main character’s dialogue mimics this approach. Andrew openly admits to his cousin that, indeed, he uses the camera to create a barrier of sorts between himself and a world where he trusts no one, where family is interchangeable with foe. Everything soon changes for Andrew (or appears to change) when the cousins attend a high school party. Steve Montgomery, the popular kid/class president (well-played by Michael B. Jordan from HBO’s The Wire and NBC’s Friday Night Lights) discovers a deep cave that the boys must investigate. As they venture inside, they discover something the true nature of which is never disclosed. Whatever it is, besides making their noses bleed profusely, it gives them superpowers. Of the three boys, Andrew is the one most adept at controlling creating, and eventually destroying things with this newfound power. He outshines the other two and becomes, finally, popular. But alas, the laughter stops as it becomes clear that no one, resentful, neglected teenage boy should have all that power. Chronicle becomes more action-packed as the boys gain control over their telekinetic powers and learn to fly (a really cool scene). But Andrew realizes that he still feels very much alone and is convinced that the friendships with Matt and Steve are based on his newfound abilities, as opposed to any real connections. 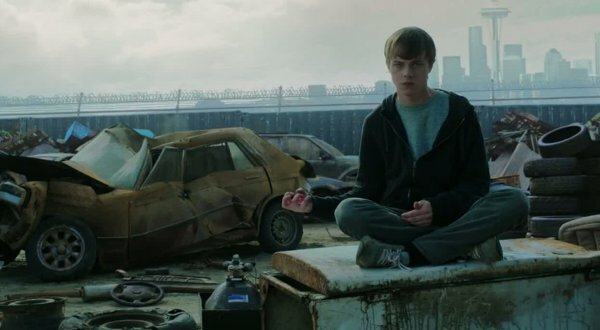 Moviegoers expecting a huge, action-packed flick (which the trailers promise) will be disappointed by the many quiet moments of Chronicle. There is much in the way of emotional disclosure and confession, which is not necessarily a bad thing. But the film is not enough of a thriller, sci-fi, action or teen film to be a consistently good film. It resists genre, but does so by accident, weakening the piece. Chronicle wants to be more interesting, more complicated than its found-footage counterparts (Cloverfield, Blair Witch Project, etc. ), and in many ways, it is. Trank clearly wanted to create a true character in Andrew, to explore familial bonds and dysfunctions and strange friendships that are as weak as they are strong. The characters, although annoying at times (being teens and all) are well-cast. They are never just problem kids, or just kids with superpowers, or creepy kids with cameras (like those wretched brothers in Another Happy Day). But the storyline of Chronicle does not fully allow for a deeper exploration of what makes them tick. Clichés overwhelm the piece, and as with most found-footage films, it gets extremely difficult to believe that someone is still determined to get the shot when all hell is breaking loose. One wonders if the short film (84 minutes) might have benefited from a slightly longer running time. Too quickly, the victim becomes the villain, and the transformation lacks authenticity—even with good, quality acting. Ultimately, the script does not ring as true as the performances, and this failure weakens what might have been a much stronger film.